We enter Match Day Five with Juventus leading the table for the first time of the season with 4 wins, 7 goals scored, and 0 goals conceded. A fantastic start indeed for Massimiliano Allegri’s men, but the Old Lady face a difficult task ahead of themselves this Saturday as the boys take on a struggling Atalanta side at Bergamo. Typically, one may not be overly skeptical headed into a game with a perfect record against a team with only 4 points in 4 games and a -2 goal-difference, but it is never easy to play at Bergamo, one of the most difficult venues in the Serie A. Every week we learn more and more about Allegri’s Juventus and certainly with a pleasant surprise. 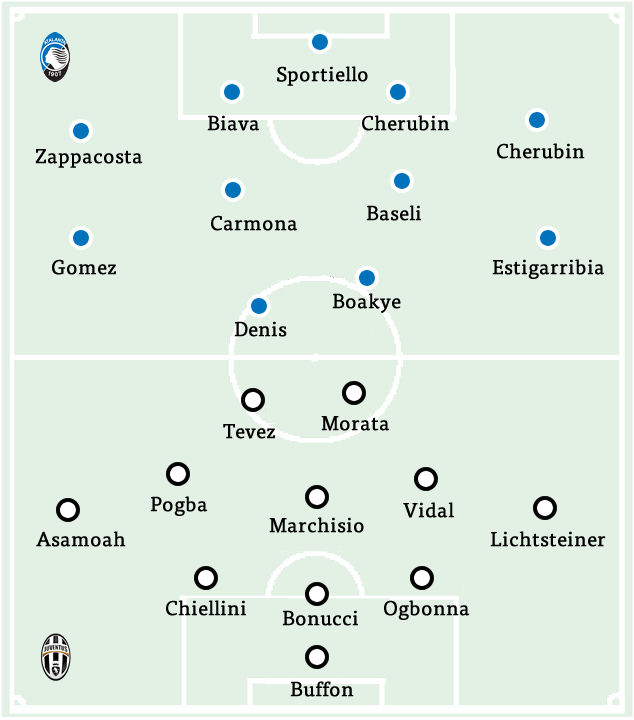 While last week’s match was against the newly promoted club, Cesena, the attack was still very dynamic without Tevez, although he will most likely return to face Atalanta. Allegri unveiled today that Barzagli and Pirlo will most likely stay on the bench against the Nerazzurri of Bergamo, while Alvaro Morata is likely to start over Llorente as he has had flashes of brilliance whenever he came on as a late sub. Llorente, however, has had trouble finding the back of the net despite playing well in the first four Serie A matches, though he has been playing well otherwise. Ogbonna will likely take over for Caceres, who had suffered a muscle problem after having an excellent start to the Season, but luckily it doesn’t look too serious. It is also possible that Romulo steps in for Lichtsteiner, who scored a brilliant goal after a majestic pass from Padoin to beat Nicola Leali at the far post to make it 3-0. There are two things to keep in mind when going into this match: Juve need to keep their heads in the Atalanta game, despite playing Atletico in Madrid only four days later, which can often cause complacency. Also, there are no shortage of key players on this “Orobici” side to keep an eye on. Atalanta have a number of great young talent, along with refined goalscorers, such as Denis, who Juventus certainly need to keep an eye on. Pairing with Denis is Richmond Boakye. The Juventus loanee is one who strives with pace and strength on the ball, and while he has failed to score more than one goal so far this season, surely he believes the perfect opportunity to snag another would be against I Bianconeri. Atalanta Manager, Stafano Colantuono will likely head into this game with a 4-4-2 consisting of some familiar names in not only the attack, but in the midfield as well. Former Juventus winger, Marcelo Estigarribia, will likely start on the right-flank next to Atalanta’s prized possession, Daniele Baselli in the midfield. Baselli has been linked to Juventus in the past, and it is certainly still possible that one day we see Baselli wearing the Black and White shirt if he grows into the high-profile Center Mid he is expected to become. Atalanta have another interesting player worth looking out for in Alejandro Gomez who arrived this summer from Metalist Kharkiv upon being handed the number 10 shirt. Gomez will likely face either Romulo or Lichtsteiner on his left flank. In the defense is another Atalanta prized possession, Davide Zappacosta. Even more so than Baselli, the 22-year-old Fullback has been heavily linked with a move to Juventus in recent mercati and will certainly get his chance to shine this Saturday with Marotta’s eyes on him. Regardless of the great young talent “La Dea” possess, their start to the season has been a disappointing one for any Nerazzurri fan. In their midweek game, Atalanta faced a strong Inter team only to fall 2-0, conceding a spectacular goal from former Juventus striker, Dani Osvaldo and another great goal from a free-kick from Hernanes. 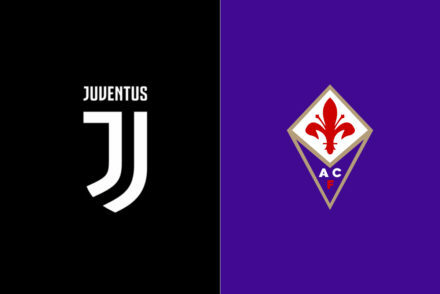 Prior to the 2-0 loss, Atalanta also struggled to get all three points from Fiorentina in their 0-1 loss and also drawing Hellas Verona 0-0 in their season opener. Atalanta did, however, manage to get all three points away at Cagliari in a hard-fought 1-2 victory over the Sardegna-based side with goals from Estiggaribia and Boakye, which are the only two goals Atalanta have scored thus far. Saturday’s match will be a true show of testament for both sides as Juventus will look to continue their perfect run ahead of the Champions League match against Atletico and Atalanta look to beat the defending Serie A Champions in their home stadium. 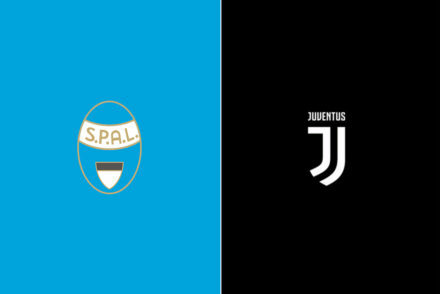 Atalanta are certainly a tough opponent for everybody, but Juventus have been very comfortable against them recently: they haven’t lost since 2001, they have won the last eight matches and they have defeated them at Stadio Atleti Azzurri d’Italia seven times in a row, most of the times commandingly. Atalanta comes off two losses: the one against Fiorentina was undeserved, while they weren’t particularly sharp against Inter. They have scored only two goals in four matches, both in Cagliari game, and their main weapon German Denis has yet to score in this season, which is probably the main reason why they are struggling. Players come and go at Atalanta, but the infrastructure is still the same. Colantuono keep using his customary 4-4-2 and occasionally he’ll switch to 4-3-3 or 3-5-2 to better face the opponent. Atalanta had some significant departures in the summer, especially in the final days of the transfer market: Andrea Consigli and Giacomo Bonaventura left to join Sassuolo and Milan respectively. They knew Marco Sportiello was going to be a solid goalkeeper and they have been preparing the whole summer for the sale of Jack. They had already brought in some young guns to replace him: Salvatore Molina, Marco D’Alessandro and Leonardo Spinazzola and they finished with a bang by acquiring Alejandro Gomez: the absence of Bonaventura should not be felt as the season moves along and the youngsters will adapt to play in Serie A.
Gomez could get his first start of the season against Juventus: he was slowed down by some bureaucratic issues in his first weeks (he didn’t practice a lot because he had to go back to Argentina to complete the paperwork). He provided a sparkle in the Inter game and Juventus will have to control him closely because his dynamism and playmaking ability could be dangerous. The biggest tactical change in this year’s Atalanta is upfront: Colantuono has three centre-forwards at his disposal (German Denis, Richmond Boakye and Rolando Bianchi), so he can use a pure 4-4-2 with two physical strikers rather than Maxi Moralez as second-striker. Boakye has been their pre-season MVP so it’s not surprising that he’s getting a lot of playing time early: he scored against Cagliari, but he also missed some chances that he should have buried, especially against Fiorentina. Juventus co-own his rights, he’s a rough diamond: he’s powerful and explosive, the technique and the finesse can improve. He’s one to watch in this season. Davide Zappacosta didn’t have any problem in the transition from Serie B to Serie B and he has been nothing short of brilliant: he has solved Atalanta’s problems in the RB position. They were already pretty good on the other flank with Davide Brivio and Cristiano Del Grosso, but Ousmane Drame is simply a better player than both of them (Brivio left). The two chains on the wings (Zappacosta-Estigarribia, Drame-Gomez) are definitely a strength. Giuseppe Biava seems to have recovered from a minor muscular injury. Nicolò Cherubin replaced him on Wednesday, which is a bit strange considering that Gugliemo Stendardo, who has been a key element for quite some time, hasn’t played a minute yet. Yohan Benalouane has started all the games. In the midfield, Luca Cigarini and Carlos Carmona have played all the time, Daniele Baselli is an option if they decide to rotate a bit after the midweek match. On Saturday night, Atalanta will crowd the central area and double Juventus’ wing back. 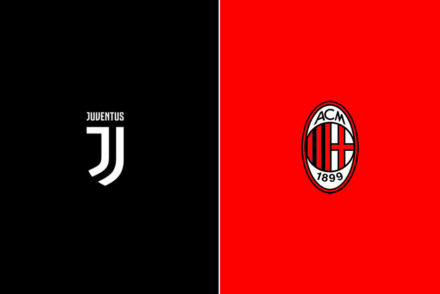 They’ll try to hurt Juventus with quick counter-attacks, taking advantage of their speed on the flanks, while the centre-forward battle to find room in the box. 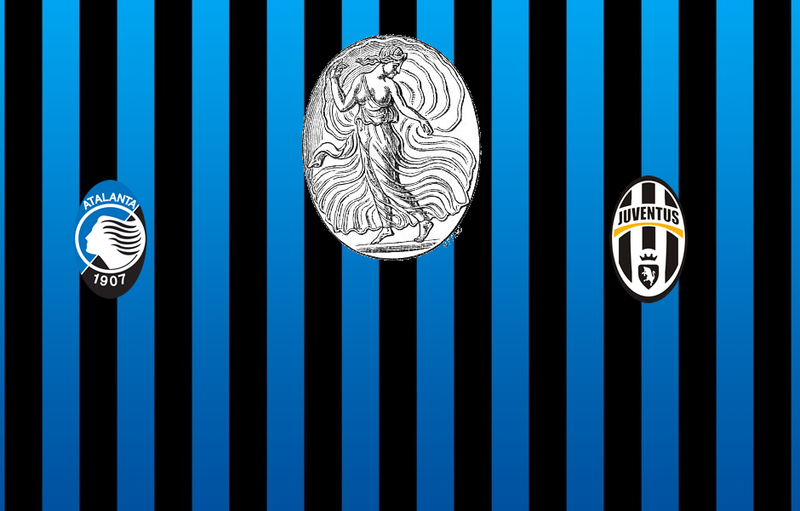 Juventus have owned Atalanta in recent history, hopefully the streak will survive. Atalanta is probably the most organized team Juventus had to face in the first weeks of the season: Inzaghi and Stramaccioni have been at the helm at Milan and Udinese for only few months, Chievo Verona had seven newcomers in the starting lineup and Cesena had yet to find their rhythm in Serie A. It will be a telling test.